Like with all industrial equipment, breakdowns can’t always be avoided. With that being the case, KES Facilities have a team of fully trained repair technicians on call 24 hours a day, 365 days a year should you experience any ventilation issues. Our unrivaled repair service is designed to get your system back up and running as quickly as is possible. KES Facilities will supply and fix all of the pieces of equipment required including Ductwork repairs, motors, ventilation plant and kitchen canopies right down to bearings, brackets and flues. Preventing an equipment breakdown isn’t always possible and whilst we service extraction installations to minimize the risk of a breakdown occurring, parts can wear with age and need replacing. Because of this possibility, KES Facilities have a technical repair team which is on call around the clock. Carrying a large stock of replacement parts, our team can respond to call outs quickly. In many instances this can avoid any disruption to your business and others will minimize disruption and have your extraction equipment back up and running as quickly as is possible. To discuss our maintenance and repair services, why not give us a call today and protect your organisation against potential risks. 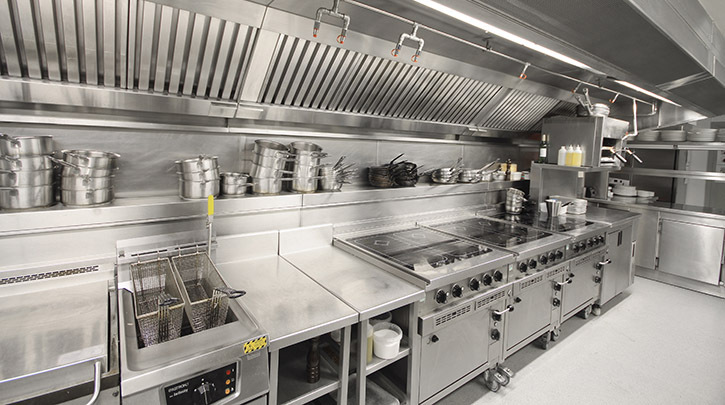 Let our commercial kitchen ventilation/extraction install team help with your project today.